These clients were referred to Scott Rajavuori of Titus Contracting in February 2017 through a friend who had worked with Titus Contracting in the past. 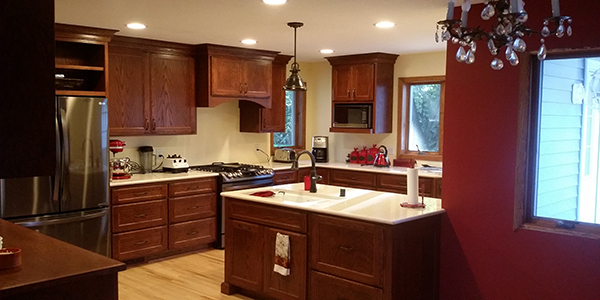 The Plymouth couple were considering a kitchen addition and remodel, with a desire to have the project designed and built starting in the late spring/early summer. After a few initial design meetings where their needs, wants and wishes were worked through, and the remodel budget was discussed, we were awarded the design/build contract. Titus Contracting finishes kitchen addition on time and pleased the client. They loved our mission and determined that we had been the right contracting choice. Scott Rajavuori, Sales and Design Manager for Titus Contracting, completed the preliminary scope of work, then the Titus Team began the design work that would turn the Plymouth customers’ dreams into reality. The design work of a project typically includes creating conceptual plans and layouts of the space, working out options for materials and finishes, and ensuring that everything encompasses the vision and budget of our clients. an eat-in kitchen arearemodel begin. Titus Contracting broke ground on the addition in late June 2017. Prior to starting any project, all our clients are provided with a detailed construction schedule they can follow as part of our desire for clear communication. One important part of the Titus Contracting commitment is clear communication and excellent schedule management. This kitchen addition and remodel included complete demolition of the existing kitchen location, then the following new components were added: foundation, framing, siding, windows, roof, insulation, drywall, custom cabinets, hardwood floor, Cambria tops, appliances, painting and finish, and millwork. We were also hired during the process to “dress up” and enhance the front façade of their home by adding a new stoop and front covered entry. We would like to thank these fantastic clients for choosing Titus Contracting when considering a huge project like adding onto their home, and completing what most homeowners consider the “heartbeat” of the home: the kitchen. We are grateful for the opportunity to work with our clients and their vision for their home, and to create a beautiful space for them to enjoy.